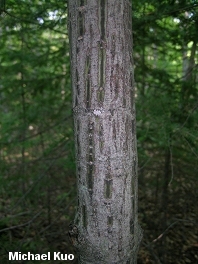 A shrub or small understory tree; leaves 3-lobed and finely toothed; bark thin, green to reddish brown, conspicuously striped; growing in northeastern North America. 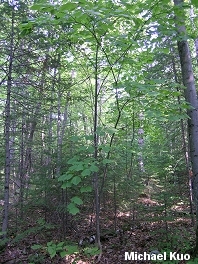 Habitat: Found in various forest types as an understory tree, often densely populating the understory of birch-hemlock forests. Stature: 10-25 feet high (sometimes up to 40 feet in the Smoky Mountains); to 8 inches in diameter; when mature featuring a compact crown. 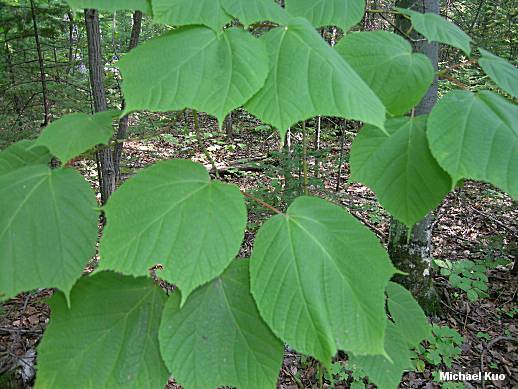 Leaves: 5-6 inches long; simple; with 3 lobes; smooth; doubly toothed; yellowish green above; paler below. Bark: Thin; green at first, later reddish brown to grayish; conspicuously striped with whitish to green vertical stripes. Fruit: A reddish brown "helicopter" under an inch long.